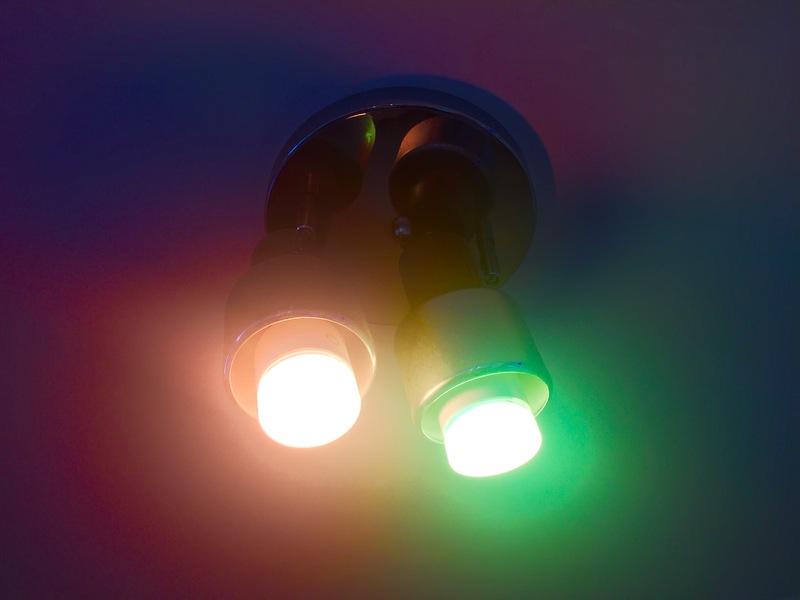 I am living with 6 LIFX light bulbs in my home – and I just love the way this allows me to redecorate my working and living space to my whim, both with simple and complex, dynamic lighting schemes. In fact, with these lights, I can’t see myself ever wanting to paint my walls with any particular color scheme again. It’s just no longer necessary – and now seems far too static and inflexible a way to make my home attractive. I’ve had my fair share of teething problems with the bulbs – at one point, after lengthy email exchanges with LIFX tech support, I returned the entire batch for a new replacement set, after a seemingly endless series of problems with lights falling into and out of being unrecognised by the LIFX app. But to their credit, with the newer bulbs, and more recently with the migration of LIFX to the cloud, the system is now working really nicely – almost glitch free. In fact it is this migration to the cloud which has finally allowed the bulbs to achieve some of the amazing potential that they have to make life more fun and more beautiful. Amazing things were promised, but not delivered by previous incarnations of the LIFX apps, which could only perform simplistic local control functions. These were fine for setting up a lighting scheme manually, or showing off the bulbs via a brief light show, but simply didn’t allow any significant form of automation. So these formed the backbone of the system, and covered 8o% of my lighting needs – the remaining 20% of finer adjustments came by controlling bulbs individually, or just occasionally by selecting some of the special effects offered by the app – one my favourites being a dynamic northerns lights type display, which unfortunately seems to have dropped out of the latest version of the app. However, there is still plenty of scope for playing and fun with the effects provided, and realistically, this is more of a show-off feature than something I’d want to use on a regular basis. When the Weather channel notifies me that it is my local sunset time (trigger), the LIFX channel fades in my Office lights. Purpose – This is designed to help me maintain good light when I am sitting at my desk, without needing to manually activate the lights. Cons – If I am not at home, or not sitting at my desk, these lights come on anyway. In order to counter this, I need to take note of the iOS notification that I receive when the sunset trigger occurs, and then manually switch off the lights. When the Weather channel notifies me that it is my local sunrise time (trigger), the LIFX channel fades out all my lights (if any happen to be on). Purpose – This is designed to avoid leaving the lights on unnecessarily, if I happen to have gotten up early and switched on the Office lights manually before starting work. Without this, I often find later that the lights are still on despite having sun streaming through the window. Cons – No major cons to this one. Perhaps if there is heavy cloud cover, then I wouldn’t want to lights to go right off, but it is easy enough for me to make a manual adjustment if I see the lights dimming themselves and want them brighter. When the iOSLocation channel notifies me that I have entered the area around my home (trigger), the LIFX channel fades in my Hallway lights. Purpose – This is designed to ensure that lights are on when I open the door, so I don’t have to fumble around in the dark, and use my phone to switch on the lights. Cons – Unfortunately the IFTTT system doesn’t allow me to combine this trigger with a daylight/nighttime condition, so if it is still daylight, then I don’t actually need lights on as there is already sufficient daylight in the hallway, and in this case I have to switch them off manually after I get home. Another, more subtle, issue is that just occasionally (once in a few days), this trigger gets activated even though I haven’t actually left home. My best guess is that this is due to occasional inaccurate GPS readings which, momentarily, locate me far enough from my true home location so as to trigger the re-entry event once the accuracy improves again. It might be possible to reduce the likelihood of this happening by choosing a larger radius for the trigger area – I’ll experiment with this further over time. Have you actually been using the sunrise & sunset features longer? I’m wondering how it works over time and how others in the household use it. Would love to hear about your experience! Hi Kevin – Yes I have used the sunset feature to switch lights on while I was away on holiday. This included also a scheduled turn off a little later in the evening. However, while I’m at home I find it more convenient to switch on and off manually. I have set up a couple of typical lighting scenarios (e.g. work lights – bright white over desk – and evening – orange throughout living area). These are activated in the app each with a single button tap, so very simple to use. So I’m still very happy with this setup. I just realised – when I wrote the article I had to use IFTTT to activate the sunrise/set feature, but some time ago LIFX added sunrise/set features into their own app. Hence I no longer need to use IFTTT at all – it’s all in the LIFX app. Very interesting. Thanks for sharing your experience & tips.